This article is part of Morningstar's 2018 Guide to IRAs special report. A version of this article appeared April 18, 2016. 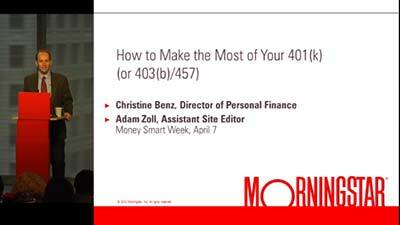 Old 401(k)s are a little like the old clothes in the back of your closet. You know you should do something about them--try them on and see if they still fit (and aren't hopelessly out of style), or donate them to charity. But inertia isn't costing you anything other than closet space, and you know the process of getting everything in shipshape could take a little time. So, there they sit--mostly out of sight and mind. In this special presentation, get the answers to key questions about the quality of your plan, whether your savings are on track with your goals, how to allocate assets, and what to do with assets when you leave your job.